In the software industry, it is a well - known fact that an operating system (OS) is the most important component of a computer. It is the primary software that manages all the software and hardware on a computer. There are different types of operating systems and Linux is one among them. In this Linux tutorial, we will start from the basics of linux and learn all the major linux concepts that a linux professional must be aware of. Now, let’s have a look at the components of this tutorial. What are the features of Linux? What are the advantages of Linux? What is the difference between Unix and Linux? What Can I do Using Linux? How can I learn Linux? What are Linux commands and how you can use them? The term “open source” originated in the software development context to designate a particular approach to the creation of computer programs. An open source OS basically refers to a type of computer software where its copyright holder grants users all over the world, the rights to distribute (to anyone for any purpose), change, and study the software. Linux is a community-developed and an open source operating system for servers, computers, mainframes, embedded devices, and mobile devices. Almost all the main computing platforms including SPARC, ARM, and x86 support linux, and this makes it one of the most widely supported operating systems. A linux distribution, also known as Linux distro, is a version of open source linux operating system and is packaged with various other components like management tools, installation programs, and additional software like KVM hypervisor. RHEL (Red Hat Enterprise Linux) from RedHat is one of the most popular linux distributions. RHEL is developed specifically for the business market. In this section, we will compare linux with another major operating system, Windows. Windows is a group of several OS families and each of its versions GUI (graphical user interface) with a desktop that enables users to view folders and files in this OS. Below here is the table which illustrates the comparison between Windows and Linux. Windows OS is very easy to use and two of its major design characteristics are simplicity and user friendliness. An average user should gain some knowledge on how to use Linux OS. And, to perform day-to-day operations, users need an in-depth understanding of the underlying system. Windows is less reliable when compared with Linux. Linux is highly secure and reliable. It focuses more on uptime, system security, and process management. Majority of the Windows games, utilities, and programs are commercial. Majority of the Linux games, utilities, and programs are open source and free. Windows provides online and integrated help systems. Also, there are many books available for all skill levels. There is massive online support available for Linux. This is through a large community of websites and user forums. Windows OS is usually used by novice users, gamers, and business users who depend on Microsoft software. Various academic, scientific, and corporate companies of every size use Linux. This OS is used to power servers and development machines at NASA, Twitter, Facebook, Google, and various other top organizations. Windows installation is very easy but it takes time. Linux OS installation involves complications but this OS can complete complex tasks faster. Over the years, Linux has gained the reputation as a very efficient and fast performing system. Its features will tell you how effective this operating system is. Now, let’s explore the major features of Linux OS. Portability - This means software can work on various kinds of hardware in the same manner. Here, port means to alter the software and make it adaptable to function on a different system. Linux OS can run on any hardware environment. Free Software - Linux can be downloaded free from the Internet. Free updates, no costs per user, no registration fees, and freely available source code if you want to change your system’s behavior. Versatile and Secure - The security model used in Linux depends on the UNIX idea of security, and it is known to be of proven quality. This is the reason why many tasks are executed at night or are automatically scheduled for other calm moments, thus resulting in more availability in case of busier periods and the utilization of hardware in a more balanced way. Multi-User System - Linux is a multi-user system. This implies the system’s resources such as application programs, RAM, memory can be accessible by multiple users at the same time. Hierarchical File System - A standard file structure is provided by linux in which user files/files are arranged. Multiprogramming - Multiprogramming is supported by linux. Multiprogramming means there will be a provision for running multiple applications at the same time. The best assets of linux when compared with other operating systems are its reliability, price, and the freedom it provides you. Now, it’s time for us to gain some knowledge about the major advantages of Linux OS. This is one of the major advantages of linux as you can download most linux distributions freely from the web. Additionally, the linux distributions can be downloaded freely and installed legally on any number of computers and can be given freely to other people. Most viruses which attack an operating system are developed via Active X software framework, and linux doesn’t have this. The same principle applies to various other viruses like worms, Trojans, or spyware. Linux systems are very stable and they won’t freeze up like other systems. You can add new features, delete things that you don’t like, and customize some features. You can do these because the source code is accessible to the public and they can make the relevant change and customize the software according to their requirements. Almost all programming languages(Ruby, Perl, Java, C/C++, Python, etc.) are supported by Linux. It also offers many applications that are useful for programming. Linux is a more famous OS than Unix in today’s world, but the latter has its own users. Unix is a family of multiuser, multitasking operating systems analogous to Windows and DOS, and this OS is used in workstations, internet servers, and PCs by several major organizations such as HP, Intel, Solaris, etc. In this section, we will have a look at key differences between Unix and Linux. Unix is a proprietary OS and it was developed by Bell Labs. It works primarily on CLI (Command Line Interface). Also, Unix isn’t as flexible as Linux and has less compatibility with different hardware types. Its installation requires a well-defined and strict hardware machinery and works only on particular CPU machines. The installation of Unix involves high cost when compared with Linux since the former requires special hardware and can run only on particular CPU processors. Unix OS is not portable and its distributions or versions are less in number when compared with Linux. The source code of Unix is not available freely and it supports fewer file systems when compared with Linux. Linux OS is based on Unix and it is basically a kernel which has a GUI (Graphical User Interface) like Windows OS. It also has a CLI and it’s optional. Unlike Unix, Linux can be downloaded, distributed freely. Also, there are priced distributions for Linux such as Red Hat Linux and they are generally cheaper than Windows. Linux is compatible with almost all hardware systems and is quite flexible. You can install and execute linux on anything that consists of a processor. The source code of Linux is available freely as this a free OS. When compared with Unix, Linux installation is highly economical. Linux is highly scalable and it supports a huge set of file systems. When compared with Unix, there are a number of Linux versions or distributions. After you have downloaded the Linux system onto your computer, you will be bombarded with all of the cool new things that you are able to do with this operating system. This field is going to talk about some of the projects that you are able to do with this great OPERATING SYSTEM. You may be surprised at its versatility. Zoph is a program that is able to work well on Linux that is going to allow you to share your personal photos with friends and family. It is going to let you import your collection of photos either through a Tar or Zip file, organize them in the albums that you want, and then will set attributes for the author and the geographic region before letting your friends and family see them. This is a great way for you to show off your pictures to those that you love without having to worry about others getting a hold of them that do not need to. Linux is good at serving files that are tucked away from a computer and the server in your home is going to soon become an essential accessory for many different companies. Mobile phones, televisions, and game consoles are quickly developing the ability to play, display, and read files that are held onto a media center PC and Linux is the perfect software that you can use to do this. All that you are going to need is a PC that is relatively low powered along with some good storage and a good place to keep it all. With the Linux system, you are going to be able to use the Rosegarden program that can help you create chords, melody and drum tracks through internal instruments before being able to save all of this to a file. In order to use this system, you will be using Rosegarden to communicate with your audio hardware along with the other audio applications. Have you ever wanted to be an author, but wanted to try something that is a little bit different? The Linux system is going to be able to help you with this. Text adventure games were really fun and popular back when computers first started and they are beginning to gain some more popularity since mobile devices are being used more frequently. It is not necessary to be a coding guru in order to write your stories either since this is going to be made using a form of your natural language. There are many different programs that are out on the market that you can choose to use for your programming needs. All of them are going to have things that you are going to love and other things that you might not like as much. There is not going to be a program out there that is going to be everything that you ever wanted because everyone has their preferences. If you have to pick one of the best programming software systems that you can get on the market, there is nothing that is better and has more benefits than that offered by Linux. Below are some of the best reasons why you should choose to go with the Linux system rather than choosing one of the other systems in the market. As you can see, there are a lot of different benefits that you will be able to get from using this system, especially when you are able to compare it to the other systems that are on the market. A Distro is a specific GNU/Linux operating system vendor package. Additionally, a distro can also be a set of open source components and software assembled together. In the Linux user community, there is a raging debate as to choose between which distro for linux is the best. The arguments are biased between which distro is the best for first timers and new users. However, our analysis is on the distro usability (ease of use) and the look and feel of the user interface (design). The distros we shall look at are on this list, because they meet the following criteria. This is the most critical factor we have to consider. The major reason why a distro must be user-friendly is because; most users are accustomed to simply sitting at a Windows or OS X desktop and commence use immediately. Making a distro hard to use is extremely unlikely that anyone will use it frequently or even like it. Adding an application to a Linux operating system is no mean fete; here is where an app store comes in. If you consider the fact that most users today are accustomed to easy to install applications on their mobile devices, it makes sense that a distro without an inbuilt app store will not be a favourite. One of the oldest app stores is synaptic. App stores make it easier for users to add software to the environment. If you take any modern device today, be it a mobile phone, smart TV, game console and many more, you will notice that all of these devices have a very modern UI (user interface). Users are very fond of the swank UI and the desktop is no exception. A distro must be enticing to the user. It must have an easy to use, but unique interface. In fact, today, most users choose a distro by checking the user interface. The first thing to do for learning linux is to prioritize your needs. As linux comes with many distributions, you have to choose a distribution that suits your needs. For choosing a distribution, you must gain knowledge on all the distributions that are available. Then you must learn about desktop environments you can utilize along with your linux distribution. Get yourself familiarized with the applications that come with your operating system. You must learn how to use the Terminal as it is present in all the linux operating systems. You can download applications and files through the terminal. Search for the Software Center application that comes with your operating system. This application will help you locate new applications you can install. Using the Terminal, you can install applications that are not present in the Software Center. You have to get familiarized with the file system and learn where common directories are present. This way, you can learn linux. If a user gives an instruction to the computer to perform a specific task, then that instruction is stated as a command. In this section, I will introduce you to basic yet highly important Linux CLI commands. These commands will provide you with a working knowledge of how to get around your linux terminal from the shell. rm - This command is used for removing files from your Linux OS. locate - Used for locating a file within the Linux OS. touch - Enables users to make files utilizing the Linux CLI. rmdir - Enables users to remove existing commands utilizing the Linux CLI. mkdir - Enables users to make a new directory. man - Utilized to display the manual of inputted command. mv - Used to move a file to another directory or folder. cd - Enables users to change between file directories. Is - Lists all the important directories filed under a given file system. A shell is a special program in an operating system which takes commands from the keyboard and provides them to OS to execute. It was the only UI (User Interface) available on Linux. Today, in addition to CLIs like the shell, we have GUIs as well. A program known as bash functions as the shell program on most Linux systems. The other shell programs that we can install in a Linux system are zsh, tcsh, and ksh. A program known as terminal emulator opens a window and enables you to interact with the shell. For using a Linux system in an effective manner, you must navigate around the file system and gain in-depth knowledge of what is around you. For this, you need to have access to the Linux server. You should also have a basic understanding of the working of the terminal and how Linux commands look like. You also should configure the non-administrative, regular user account. With the help of pwd command, you can find where your home directory is in a relationship with the rest of the file system. You can see directories’ contents with the help of ls command. A command known as the cd is used for changing a directory by providing an absolute path. So, for exploring the Linux filesystem, you can use these 3 commands. Whenever a program is launched by Linux or by the user, a process is created by Linux. A process is actually a container of information about what is happening and how that program is running. If the Linux process runs and terminates perfectly, everything will be fine. However, if the process refuses to terminate when its time is up, or if it hogs the CPU, we can use a few Linux commands to help restore the functionality of the process. While managing a Linux process, you must observe which processes are running and see how much of Linux system each process is utilizing. Locate a specific process to view what it is doing and if any action is needed. You have to define or alter the priority level associated with that process. If the process is misbehaving, you can simply terminate it. Below here are few commands which can be used to manage Linux processes. They can be entered through the CLI. To access CLI, simply open a terminal window. top - Provides information on the currently existing processes. htop - This is like a top, but smarter and prettier. It presents information in a clearer format. ps - For listing running processes. pstree - Used for showing a tree diagram of Linux processes, and also the relationships existing between them. who - It will list out the users who are currently logged into the Linux system. kill - For terminating a process. All files and directories in Linux are located in a tree-like structure. The file system root is the topmost directory. This is the directory from which all the other directories are accessed and are arranged in a hierarchical structure. The key features of a Linux file system are specifying paths, drives, partitions, directories, mounting and unmounting, file extensions, case sensitivity, file system permissions, and hidden files. The file formats with which a standard Linux distribution offers the choice of partitioning a disk are as follows. ext2, ext3, and ext4 - These three file systems are the progressive version of ext (Extended Filesystem). ext was developed primarily for MINIX. While ext2 was an improved version, ext3 came up with an improvement in performance. The arrival of ext4 saw an improvement in performance along with a few additional features. Journaled File System (JFS) - JFS is a file system developed by IBM for its AIX OS. JFS keeps track of changes to folders and files in a log file. ReiserFS - ReiserFS is an alternative to ext3 with advanced features and improved performance. XFS - A high speed Journaled File System aimed at parallel I/O processing. Btrfs (B-Tree File System) - Focuses on large storage configuration, repair system, fun administration, and fault tolerance. While working on Linux OS, it’s important that we build a directory structure that will enable us to organize our data in a manageable way without wasting a lot of time searching for a particular file. In this section, I will let you know a few commands that are useful for file creation and manipulation. mkdir - used for the creation of a directory. rmdir - for removing a directory. touch - for the creation of a blank file. cp - for copying a directory or a file. mv - for moving a directory or a file. rm - for deleting a file. Though Linux OS has a lot of security features, there is a possibility of the existence of potential vulnerability when local access is granted. This implies that file permission based issues will come up if a user doesn’t assign correct permissions to directories and files. So, there is a need to assign permissions correctly and below here are the ways to assign permissions. There are 3 user based permission groups for each directory and file. They are given below. Group permissions - These permissions are applied only to the user group that is assigned to a directory or file. The other users are not affected by these permissions. Owner permissions - These permissions are applied only to the owner of the directory or file. The actions of other users will not get impacted by these permissions. All Users permissions - These permissions are applied to every user existing on the system. There are 3 types of permissions for each directory or file. They are as follows. Write permissions - These permissions refer to the capability of a user to write or modify a directory or file. Read permissions - These permissions refer to the capability of a user to read the file contents. Execute permissions - These permissions affect the capability of a user to view the contents of a directory or execute a file. The permissions can be viewed by checking the directory or file permissions in your GUI File Manager. Linux is one of the emerging IT technologies and is an excellent opportunity for people who are looking for jobs on this platform. Its technological landscape reveals that it has a lot to offer in the coming years as well. Almost every reputed organization is looking for a Linux certified engineer as, nowadays, it has become quite difficult for them to find knowledgeable and experienced candidates in Linux for their company. The job titles that depend heavily on Linux skills python developer, DevOps engineer, system administrator, system engineer, Java developer, Linux administration jobs, C++ Developer, etc. Various Linux job roles are Linux Administrator, Linux Engineer, Linux Systems Administrator, Senior Software Engineer, etc. The roles and responsibilities of a Linux Administrator include maintaining, configuring, as well as installing the Linux workstations and servers. They are responsible for maintaining the health of servers and network environment. By complying with the company’s security standards, Linux administrators must make sure they provide solutions and support and solve user requests. They are also responsible for evaluating the software and hardware technologies and must remain updated with the knowledge of the Linux system. 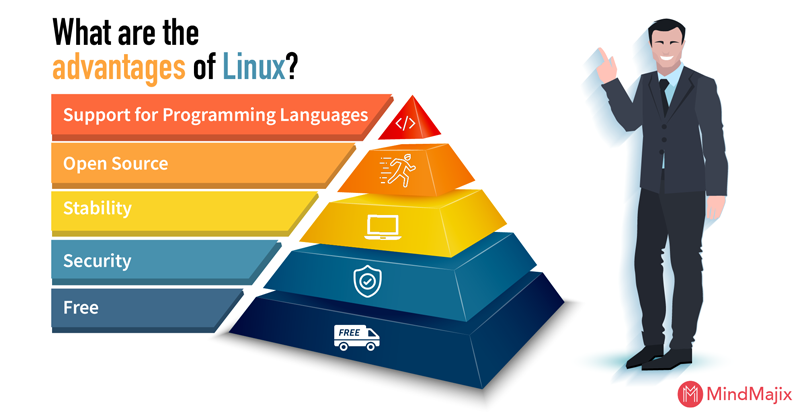 With many Linux jobs out there, the very next question that arises in our mind is the salary offered for these jobs. If a candidate is hired as a software developer or a system administrator without holding any certification, he/she is expected to draw $100000 a year. However, people having Comp TIA Linux Certification can earn 8 percent more than what others are earning in the same field. Thus, this linux tutorial will provide you with an understanding of what Linux is all about and help you gain in-depth knowledge on all the Linux concepts. Explore Linux Sample Resumes! Download & Edit, Get Noticed by Top Employers!Download Now! Sandeep is working as a Senior Content Contributor for Mindmajix, one of the world’s leading online learning platforms. With over 5 years of experience in the technology industry, he holds expertise in writing articles on various technologies including AEM, Oracle SOA, Linux, Cybersecurity, and Kubernetes. Follow him on LinkedIn and Twitter.